Join us as we take a look at anger and how we can shift to a higher energy and a more spiritual way of being in the world. I’ll be sharing some ways you can use EFT Tapping to eliminate anger. Spending time in anger is a total WASTE of our time! It’s taking us in the wrong direction: it’s generating negative energy vibration, it is closing our heart chakra, and it is keeping us in the energy of FEAR. We’re never angry for the reasons we think we are! Find out how you may be projecting your own anger with yourself on to others. You will also discover how you can embark on a journey of “Shouldless Living” as well. When we go through life dealing with one “should” after another, we are not at peace. We’re in resistance, hesitation and conflict. Join us as we tap away “Should’s”. Following our “shoulds” leaves us being directed by others. When we take the higher road in life, shifting from anger and suffering and “shoulding”, we become aware of higher wisdom, knowledge, discernment, and unconditional love. These things are available to us all when we allow our negative thoughts and feelings to shift. EFT is such an amazing tool to help us do just that. 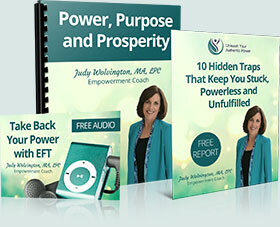 Empowerment Coach Judy Wolvington helps high achievers who are feeling stuck, stagnated, and overwhelmed. 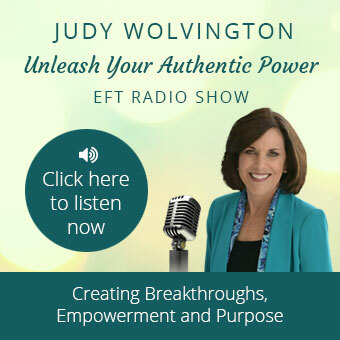 As a Certified EFT and Matrix Reimprinting Practitioner Judy skillfully helps you craft a joy-filled life that is filled with meaning, power and purpose.